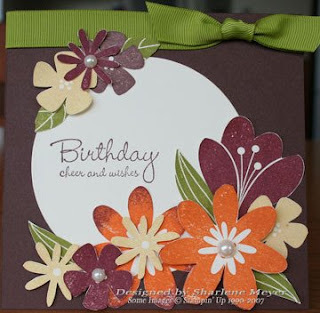 I love this card - just check out all the layers! 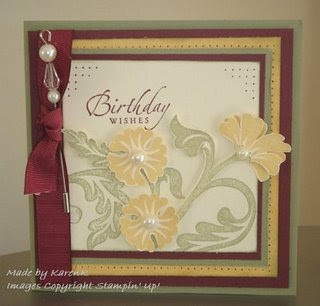 Sharlene created this gorgeous card for the latest KWerner Colour Challenge and she's done a fab job. 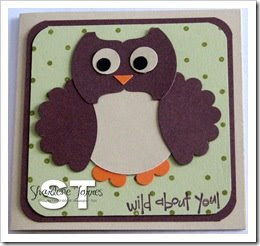 Check out the close up on Sharlene's blog Magpie Creates. It's been forever since I gave my heat tool a workout! 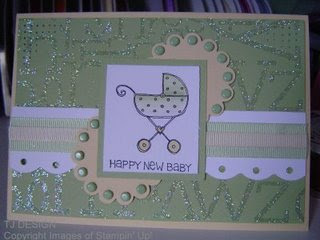 Here's a little quickie I whipped up last night and I'm addicted to embossing all over again! Like lots of stampers, heat embossing was what got me hooked on stamping (I started out using my toaster as a heat source!) For all the "how to make it" details, please see my blog: thINKingstamps Thanks for the fun challenge Trudi! I had time for a quick click or two round the blog world this morning...and spotted this beauty by Stevie. Isn't it gorgeous? I especially love the glitter accent (and that she managed to get the glitter to show up in the photo!) I can't believe I've had this set sitting there uninked - thanks for a great idea on using that large image Stevie! Sarah has to be one of my favourite designers and best of all she's a Kiwi demo. 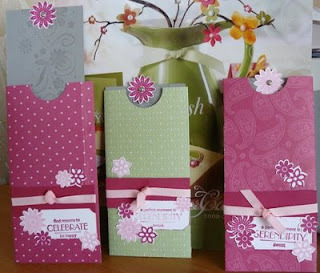 I love how simple this card is and it's made even simpler with the Three For You Punch Box. 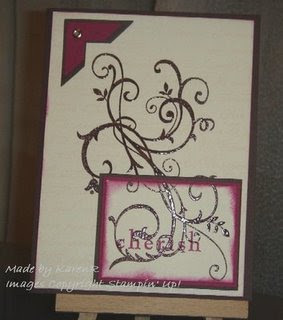 Check out more of what you can create with the Punch Box on Sarah's blog thINKing stamps. I had a final blog hop before bed, and had to post this card. Isn't it just soo pretty, it's yet another added to my desktop. I found it on Karen's blog and was created by Denise Ibbett. Check out more on Karen's Blog. She's a great upline and an even better friend. Michelle I hope you enjoyed your day of coffee and sun. Ohh I almost missed this one. Diane's email got lost somewhere along the way. Thank goodness she emailed me again today. Here's Diane's Sketch Challenge card. Diane's used the 'rock and roll technique' to stamp her image. It's a great easy way to add two colours to an image and give it more depth. Check out the rest of Diane's blog HERE. Kim also belongs to Michelle's stamp club. 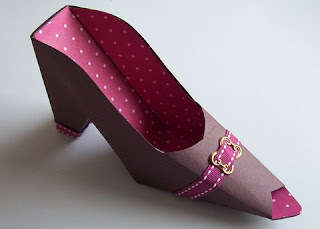 This is the shoe that she made. Even though we all used the same template and base colour it was great to see how everyone's shoes turned out so differently. And check out the matching handbag card - what more could a girl ask for? Over the last few days I've emailed out the template to at least 20 people, so I can't wait to see what you all come up with. Check out what else Kim's been up to on her blog INKin Fun. Isn't this card adorable! I love how the background glitters and sparkles! 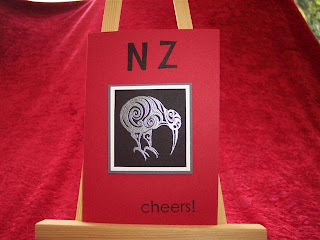 This very cute card was made by the talented Tracey. 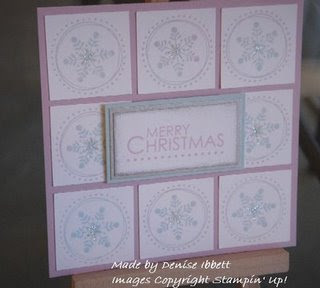 Check out more of her creations at Stamping All Seasons. Aren't shoes the greatest? Since I've had children my clothing has gone up a size or 3 but my shoes are still the same size (YAY!!). 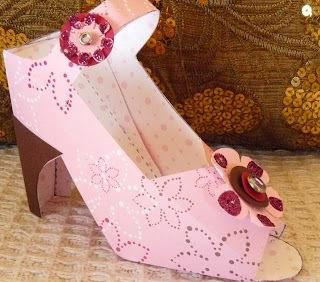 Here's Susan's shoe, she's used Choc Chip Cardstock and Rose Red Prints DSP and the gorgeous Purely Pomegranate Ribbon. I hope this inspires all of those who I've emailed the template to, to have a go. For more details check out my blog Made By Me. 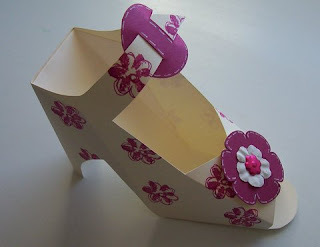 A Shoe Challenge - I'm not the only one who loves shoes and I got to make one today. Have a go at your own, you can use the same template I did or make your own. Be creative and have fun with it, get busy with the bling! Email me or link your entries under comments and for if you want the template email me. 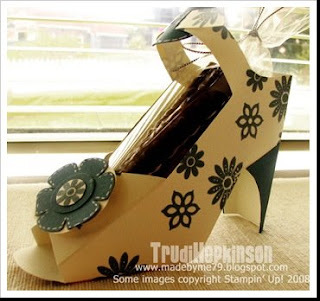 trudi.hopkinson@clear.net.nz (my email addy has changed but the old one still works as well). You can see a close up and the details on Karen's blog The INKredible Journey. I got a lovely surprise tonight when I got home from work. I received an email from Katrina a Kiwi lady over in Aussie. 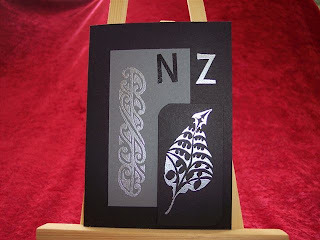 She's been busy making these gorgeous cards - so nice to see she's been thinking of home and using the Kiwi themed set. 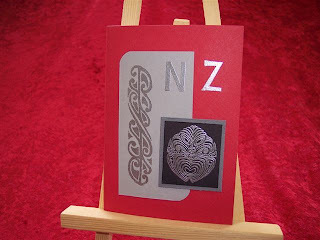 Thanks for entering Katrina, I hope your workshops go well, if all your cards are as stunning as this I'm sure they will. I couldn't decide which of Lisa's creations to post, so I've posted both!! 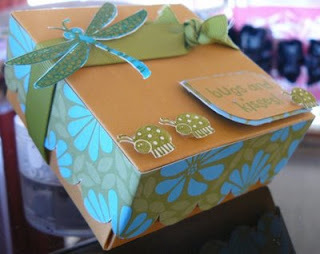 The first is a sweet little box made with Cute as a Bug which is great for both boys and girls and the second is a great pull out card which I'm sure you could easily switch out the colours to suit guys as well. 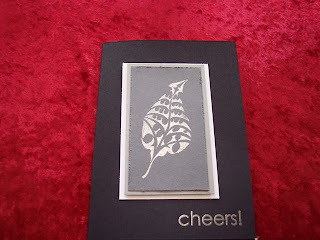 To check out the details of the amazing projects go visit Lisa's Blog Stampin' Up! With Lisa. Yay! Finally back online, I had to sit on the phone listening to Kenny G (or something) for an hour before I finally got to talk to an actual person. 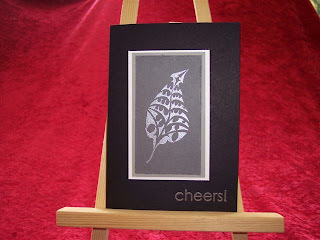 So finally here's Diane's card that she made for the Embossing Challenge. I love how the butterflies pop up and how she's used the vellum. 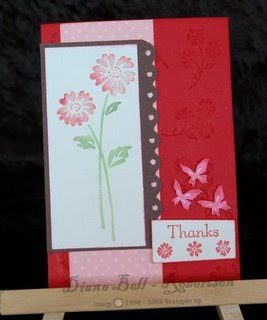 Check out the details for Diane's card on her blog for the love of paper.